Now that is a statement piece. The detail is stunning! And the styling of this photograph is perfection - love it mixed with the blue and white pottery and the repetition of the sun motif in the little mirror. I think what I love most about it is that it's so ornate, yet I think it can blend with so many different styles. It can certainly lean traditional. But I also think it has this Spanish/California-cool vibe to it (and reading the description it says it's based on an antique Portuguese armoire). 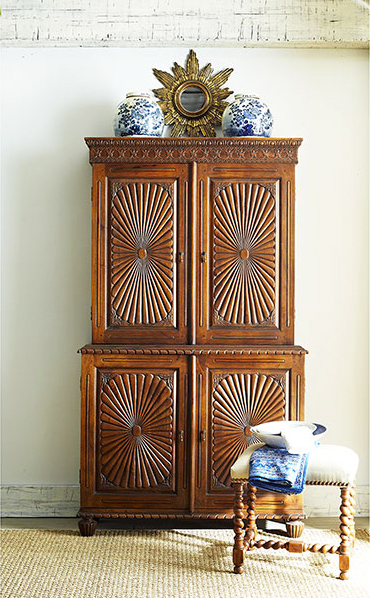 And not to mention that it would be amazing with Chinoiserie and Regency styles. And the tone of the mango wood is just delicious - that perfect shade of rich caramel brown. This is a piece that you save your pennies for and then are so thankful you have it decades later when you're looking at it and still loving it.